originally purchased this rug while on a trip to Morocco. 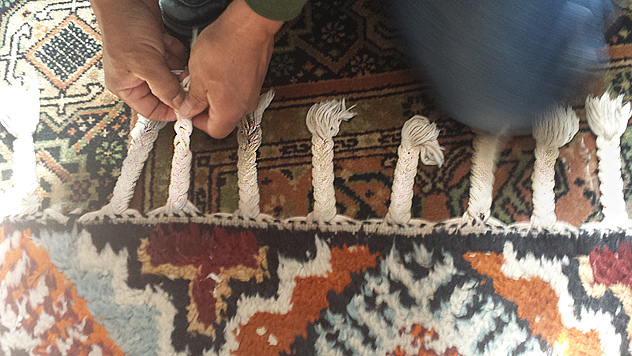 Finishing touches on the repair of the braided fringes on this Princeton NJ client’s Moroccan Rug. In repairing and restoring this rug to its original condition, including the braided fringes, we hope this woven keepsake will retain its nostalgic value and thus continue to reflect the good memories for its owners. All the best! This entry was posted in Repair & Restoration of Oriental Rugs and tagged incidental purchases made years earlier suddenly hold great sentimental value, Nejad Rugs can repair and restore Oriental rugs to original like-new condition, Nejad Rugs repairs braided fringes on Moroccan rug for Princeton NJ clients by Theresa Nejad. Bookmark the permalink.